Ninety percent of all training is a waste of time (reveals a US investigation) either because the training is not transferred into the workplace, or the training design/delivery is poor or the participants are unable/unwilling to learn. 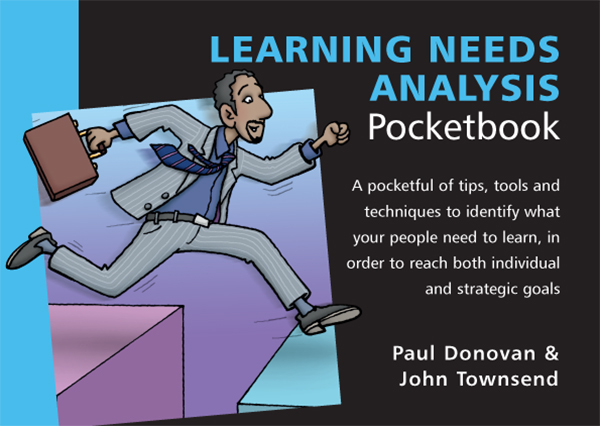 The Learning Needs Analysis Pocketbook will ensure that your people development solutions are tied to the organisation’s strategic plans and objectives. The authors simplify the analysis process and demonstrate that it can be strategic, rewarding, career-enhancing and, even, fun! The book is divided into three sections: 1. The Six Windows: a method of looking into the organisation to identify the most pressing and results-oriented learning needs. 2. The 10 Point Training Plan: the document, spreadsheet or wall chart where you can record all your notes from the learning needs investigation and plan for each training course or event. 3. The Tool Box: to help you do a great job at every step of the process. Previously published as Training Needs Analysis Pocketbook.